Images: Yellow Bird Mermaid by Stamp Oasis. Birds by Magenta. Ledge 054F, Tall Peak 182G, Brook Falls 184G, Pines & Rocks 195G, Cloud (Cumulus) 018E, Cloud w/Moon Lg 106G. Note: In this scene the composition reflects Danielle's composition II. 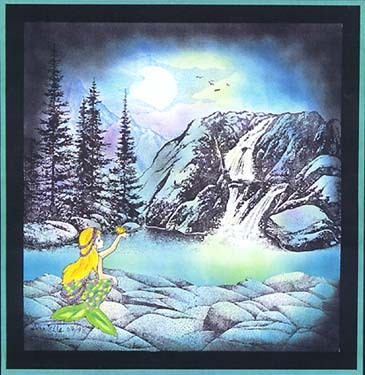 In another example of pushing space she has stamped out the midground trees and waterfall in black while using a light blue for the background mountain --giving a feeling of distance. Illumination is present on the rocks and water's surface by leaving lighter regions by applying color selectively. An overall cool composition is extended in temperature by adding warmth to the water and clouds using a warm green and in the cool color scheme, pink is added --both of which relates to the mermaid's own color scheme.